The post explains the construction of a ultrasonic directive speaker system also called parametric speaker which may be used to transmit an audio frequency over a targeted spot or zone such that the person situated exactly at that spot is able to hear the sound while the person next to him or just outside the zone stays completely untouched and unaware of the proceedings. The outstanding results obtained from the testing of Long Range Acoustic Device (LRAD) inspired the American Technology Corporation to adopt a new name for it and was changed to LRAD corporation on March 25th 2010. Also called the Audio Spotlight, it is a product of Holosonic Research Labs, Inc and is used for non-military applications. The device is designed to generate intensely focused sound beams over a targeted area only. The unit may be well suited in places such as museums, libraries, exhibition galleries where its sound beam may be used for sending a warning message or instruct a particular mishaving person, while others around are allowed to carry on in perfect silence. The focused sound effects from such a parametric speaker system is so accurate that anybody who is targeted with it becomes hugely surprised to experience the focused sound content which is heard only by him while the guy just beside him stays completely unaware of it. Parametric speaker technology employs sound waves in the supersonic range which have the characteristic of travelling through almost the line-of-sight. However one may wonder that since supersonic range may well be beyond the 20kHz mark (40kHz to be precise), could be absolutely inaudible to human ears, so how does the system is able to make the waves audible in the focused zone? One method of implementing this is to use a two 40kHz beams with one having an audio frequency of 1kHz superimposed and angled to meet at the directed point where the two 40kHz content cancel each other leaving the 1kHz frequency audible at that particular spot. The idea may look simple but the result could be too inefficient due to the low volume sound at the directed spot, not good enough to stun or incapacitate the targeted people, quite contrary to the LRAD. Other modern methods of producing audible directive sound using supersonic waves are through amplitude modulation (AM), double sideband modulation (DSB), single sideband modulation (SSB), frequency modulation (FM), all concepts depend on the recently researched parametric speaker system technology. Needless to say, a 110 dB+ supersonic wave could be nonuniform with its sound force distribution while it's in the course of propagation across a long air mass "tube". Due to the non uniformity of the sound pressure an immense amount of distortion could be experienced which could be highly undesirable for applications in peaceful places such as in museums, galleries, etc. The above non-linear response is produced due to the fact that air molecules take relatively more time to arrange themselves to their previous original density compared to the time taken for compressing the molecules. Sound created with higher pressures also results in higher frequencies which tend to generate shock waves while the molecules collide with the ones being compressed. To be precise since the audible content is constituted by the vibrating air molecules that are rather not entirely "returning", therefore when the frequency of the sound increases, the non uniformity forces the distortion to become much audible due to the effect which could be best defined as "air viscosity". Therefor manufacturer resort to the DSP directive speaker concept which involves much improved sound reproduction with minimum distortion. The above is complemented with the inclusion of highly advanced parametric transducer speaker arrangement for getting an unidirectional and clear sound spots. The high directivity created by these parametric speakers is also due to their small bandwidth characteristics which could be enlarged as per the required specification by simply adding many number of these transducers through a matrix arrangement. DSB could be easily executed using analogue switching circuits. The inventor initially tried this, and though could achieve a loud sound, it accompanied with a heck lot of distortion. Next, a PWM circuit was tried, which employed the concept akin to FM technology, although the resultant sound output was much distinct and free from distortion, the intensity was found to be a lot weaker compared to DSB. The drawback was ultimately solved by arranging a double channel array of transducers, each array including as many as 50 numbers of 40kHz transducers connected in parallel. Referring to the parametric speaker or ultrasonic directive speaker circuit shown below we see a standard PWM circuit configured around the PWM generator IC TL494. The output from this PWM stage is fed to a half bridge mosfet driver stage using the specialized IR2111 IC. The IC TL494 has a built-in oscillator whose frequency could be set through an external R/C network, here it's represented through the preset R2 and C1. The fundamental oscillating frequency is adjusted and set by R1, while the optimal range is determined by appropriately setting up R1 and R2 by the user. The audio input which needs to be directed and superimposed on the above set PWM frequency is applied to K2. Note that the audio input must be sufficiently amplified by using a small amplifier such as LM386 and must not be sourced via headphone socket of an audio device. Since the output from the PWM stage is fed across a twin half bridge IC set up, the final amplified supersonic parametric outputs could be achieved via two outputs across the shown 4 fets. The amplified outputs are fed to an array of highly specialized 40 kHz piezo transducers via a optimizing inductor. Each of the transducer array may consist of a total of 200 transducers arranged through a parallel connection. The mosfets are normally fed with a 24V DC supply for driving the piezos which may be derived from a separate 24V DC source. There could be a host of such transducers available in the market, so the option is not limited to any specific type or rating. The author preferred 16mm diameter piezos assigned with 40kHz frequency spec typically. Each channel must include at least 100 of these in order to generate a reasonable response when it's being used outdoors amidst high level of commotion. The spacing between the transducers is crucial so that the phase created by each of them is not disturbed or cancelled by the adjacent units. Since the wavelength is mere 8mm, positioning error of even 1mm could result in a significantly lower intensity due to phase error and loss of SPL. Technically, an ultrasonic transducer imitates the behavior of a capacitor and thus it could be forced to resonate by including an inductor in series. We have therefore included an inductor in series just to achieve this feature for optimizing the transducers to their peak performance limits. The internal capacitance of the 40 kHz transducers could be around 2 to 3nF, thus 50 of them in parallel would result a net capacitance of about 0.1uF to 0.15uF. Using this figure in the above formula we get the inductor value to be in between 60 and 160 uH which must be included in series with the mosfets driver outputs at A and B. 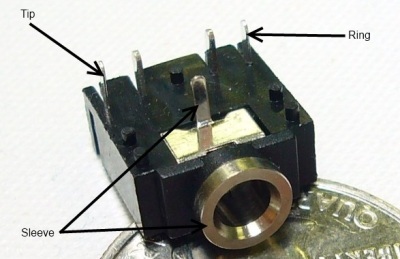 The inductor uses a ferrite rod as may be witnessed in the figure below. The user could peak up the resonant response by adjusting the rod by sliding it within the coil until the optimal point could be struck. Circuit idea courtesy: Elektor electronics. In my prototype I experimented with an audio transformer as shown below for the required amplification, with a single common 12V supply. I did not use any resonant capacitors therefore the amplification was too low. I could hear the effect from a distance of 1 feet exactly across a straight line with the transducer. Even a slight movement caused the sound to disappear. Transducer wiring details can be seen in the below given figure, you will need two of these set-ups to be connected with points A and B of the circuit. The transformer can be suitable step up transformer depending on how many transducers are selected. Prototype Image: The above parametric speaker circuit was successfully tested and confirmed by me using 4 ultrasonic transducers, which responded exactly as specified in the article explanation. However, since only 4 sensors were used the output was too low and could be heard only from a meter away. Caution — Health Hazard. Appropriate measures must be taken to prevent long term exposure to high ultrasonic sound levels. I am Mudit Agrawal, 2nd year UG from IIT Kanpur. I am planning to pursue this project in summers but wanted to first know the results of your prototype. I would be very grateful if you could share the observations about the distortions and sound quality. I tried it using 4 transducers and 1 channel output. I could hear a faint audio exactly in line with the transducers from a max distance of 1 feet. The audio was fed from my PC speaker headphone jack at high volume. The audio quality had some distortions since the output is through transducers whose response cannot be as good as a normal loudspeaker. Hello, I dont know how to make make the PWM modulation by software (pararel port or arduino). If I set on Arduino the PWN at 40 khz, and change the duty cycle every 1/40000 secs, but how much? for example max adc in is 1024 and duty cycle max is 100%·, do I must put like this? Sorry, my Arduino knowledge is not good so it can be difficult for me to solve this for you! I Think this is what TL494 does because the audio input goes to its pin 4 that is a voltage controler for the duty cycle, so when the audio suppose that when the audio volume is vol high, there is voltage high (but i dont if only positive or negative too), and then the duty cicle is bigger for on that for off in the PWM output. I will try to build our circuit with only one half with 4 ultrasonic transducers. Sir seeing prototype image it seems like you have not used the diode and variable resistor, can you please mention the actual circuitry of the prototype. Sabhay, The pots were present while testing the prototype, later I removed it for some other circuit. The prototype image was clicked recently, while the testing was done years ago. Sir, radio shack audio output transformer is not available in any of the online stores can you please provide the link where it is available or mention it’s subtitute. Sir, i wanted to know.. how can i proceed stage by stage.. like.. what all should be the inputs and respective expected outputs at each stage.. anything i can deduce by using signal generator, CRO, multimeters… Etc.? Hi Ganesh, The TL494 is designed as an ADC, it’s job is to convert the analogue music signal into proportionately varying PWMs at pins9 and 10. You can confirm this by check the results with an oscilloscope. The other two ICs are basically used as push pull amplifiers, or inverters for driving the output load. Sir these ultrasonic transducers you mentioned in the article.. are these the same ultrasonic sensors like ZT40 and ZR40 pairs..? If not, from where can i get these transducers…? We need ultrasonic “transmitters” only right? Or are we employing receivers anywhere in the circuit? I think the same unit works both like transmitters and receivers. here we are using it only as transmitters. Sir i cant get these ultrasonic transmitters anywhere.. can only find ultrasonic sensor modules (HC-SR04) instead. Tried plucking Txrs out from that but that would affect the spacing between the transucers right? Can you share some contacts from where i can get those transducers delivered? Hi Ganesh, since I stay near Mumbai, I could easily get them from Lamington Road in Grant road. They are out of stock in almost all online stores.. could you please share contact of any source where the product is available and can parcel the product to Ernakulam, Kerala. did you try amazon , ebay and aliexpress? they seem to be having a few but are very costly. Ya.. ebay out of stock.. amazon just 1 left in stock.. and as u said.. too costly..
Hi sir, I am a final year engineering student. I am trying to build this directional speaker as the major project this year. A few of my doubts are: to begin with, can we test the circuit stage by stage on Pspice like platform.. if so.. how much input should i give to pin 4 and not quite clear as of.. in what way to feed the input. Like from an audio source..
Also in practice, kindly suggest how should v proceed stage by stage…. Hi Ganesh, I cannot suggest regarding Pspice, but I can help with the practical implementation. Sir, what is the IC 7812 for.. where should v connect it to.. also what is the K1 input to IC 7812? Also if am using both IC2 and IC3, should i setup two different arrays of txrs (2 diff pcbs) or all transmitters on a single pcb? Hi Ganesh, IC7812 is a 12V voltage regulator IC which will produce fixed 12V output when any voltage between 14 and 35V is fed at its input. yes you will have to use two different arrays across the two IC outputs which will operate alternately creating a concentrated push pull sound effect. But the two arrays will need to be assembled on a single common board, not separately. We are also from Ernakulam (Govt. Engineering College, Ernakulam) and doing a project on the same topic. It would be helpful for both of us to communicate and make a detailed discussion on our project. Can you please share your number or make a call to 9526471598.
sir….is your c4 and c6 Polarized Capacitor? in that case you can try removing the jack and connect the wires directly with the input of the amplifier. I seem to be having a problem. I can't hear any music even after connecting the audio source (music player of my smartphone). The 3.5mm audio jack that I'm using is not damaged. However, I can hear the initial sound when ultrasonic transducers are activated after connecting the power supply, which is 24V. I have included only one channel (IR2111 connected to pin 10 but not pin 9 of TL494). Please help. I'll be happy to any provide further details, if required. Hello, how many transducers did you use? In my prototype I had used just a couple of them, and I could hear hardly anything when my ears were positioned precisely in line with them…and that's exactly how it should work…unless your ears are in line with the transducer assembly axis you are not supposed to hear anything. try positioning one of your ears in line with the transducer assembly and you might certainly be able to hear the sound, albiet at a very low volume. …and please note that you will also have to optimize the pots/presets correctly for achieving the most favorable sound quality and volume. I have used 16 transducers (16mm,40kHz), all connected in parallel as shown above. Yes, I could hear a low volume distorted sound from the transducers as soon as they are supplied power. Setting the pots simply varies the sound quality of the distorted sound. I had used only two transducers and I could hear the sound at very low volume, I had to bring my ear at around 4 inches near the transducers and in line with it to hear the music….shifting away from the line instantly made the audio disappear. however the music in my design was pretty clear after some optimization of the pots. you can try replacing the inductor with an audio transformer and see if that helps in increasing the volume…I had used an audio transformer in my prototype. The speakers are working fine with the inductors (I'll also try with audio transformer). I guess the main problem lies in the PWM circuit. The circuit that I have built contains a 3.5mm audio jack socket for audio input signal. The outer 2 pins i.e tip & ring (see picture) are tied together and connected to one end of 0.1uF capacitor. The other end is connected to pin 4 (DTC) of TL494. Despite the circuit being as per the schematic, no music can be heard on connecting a 3.5mm jack audio cable. I seem to be having a problem. I can't hear any music from ultrasonic transducers even after connecting the audio source (which is the music player of my smartphone). However, I can hear the initial sound when ultrasonic transducers are activated after connecting the power supply. The audio jack has no problems. I have included only one channel (IR2111 connected to pin 10 but not pin 9 of TL494). Power supply is 24v. Please help. I'll be happy to provide further details, if required. Sir…on what board did u mount your transducers on??…. Since I am a noob…is it possible to explain how to input horn frequency?? making the horn circuit will be easy but making the above directive circuit can be much difficult…so first try to successfully finish the above design then we can proceed with the horn circuit. I would like to know that, the circuit could me modified in a way such that a switch produces a sound(like an horn). Dear Nithin, you will have to feed a horn frequency at the input of the above explained circuit to get a directive horn sound on the selected spot. can please list the components you used in the circuit you gave and is this battery powered if not how would i adapt the circuit. please click the diagram to enlarge, you will be able to find the part numbers marked beside the symbols. Sir, I am searching for the details of speaker required to make a unidirectional sound system using a 24" Dia polycarbonate cleat dome. Vijayan, use ultrasonic transducers as explained in the above article. I am a bit confused about this circuit because it is not working . I suspect that the problem is from the audio input . Can you please help with this issue and tell me how to connect the audio input from a device to the lm386 op amp and to the circuit ? Can you please assist me with this circuit ? I am confused about the audio input to the circuit , i must add an lm386 op amp but i am not knowing how to connect it to the circuit . Audio input should be applied across C2 end and ground…connect the output from the LM386 with C2, and make the negative or the ground of the LM386 common with the above circuit. I don't see how you end up with the right values with the equation you have provided for the LC part. I've worked backwards from the versions of the boards I have here with the inductance values I can clearly see on all of the different types I have. The idea is not mine, it is as per the original inventors write up. Sir, can you please share your work by photograph or video? Hey Swagatam, may you explain to me, why the volume all in all depends on the spacing of the speakers? The wavefront of the speakers should just depend on the speakers beeing in phase, I'd say. And there the spacing doesnt matter. I could just guess, that you need to have a multiple of lambda between the centerpoints of 2 speakers, but I dont see why? the spacing between the speakers is crucial because if they are too wide apart, the waves will not be able to concentrate over a smaller area and weaken itself. halai, initially do not use both the IR2111 stages, use only one stage, once it gets confirmed, then you can build the second IR2111 stage for doubling the power. connect red/white across the mosfet junction and ground….use the secondary outer taps for connecting with the transducers…ignore the center tap. Please tell me why isn't it working? wat about spacing between transducer. and i m mot getting ferrite core inductor in market with need value..
please guide me that you have used 2 variable resistors please tell me the value of resistor i need to set for this circuitry ?? halai, please click the diagram to enlarge it, you will find all the details in the diagram itself. please guide if I use 10 piezos each side what will be the inductor value used for this ciruitry? Please make me correct if I am wrong! C in the formula should be in Farads, so the capacitance should be first converted to farads from uF first for getting correct results. It's better to check it manually by shifting the ferrite rod to and fro and optimize for the best possible results. Can you please guide of how much transducers should I use to have a nominal volume of sound? like a person if 2 meter or less away be easy to hear the spot light sound ? I have some Qs: 1. Capacitor 1 = 3n3 what is this? is ot 33 nF of 3 nF? 2. Is there any alternative for IR2111 that can be used for the same circuitry? I had used the same IC, so not sure about a replacement for it. Try googling for "half bridge mosfet driver IC" you could come across a few possible equivalents and modify it to suit the requirement. sure, I'll try my best! Oh thats good!.. Thanks Swagatam for your reply, If I need any assistance regarding the circuitry will you help me out? Is this circuitry working? have some one tried it? is some 1 having issues?? i have tried it, it works…however since I used only with 4 tranducers the output was too low….but the directive feature definitely worked. Ram, I'll try to get the required info, if i get any will post it for sure.